Moschino Circus Resort Summer 2019. 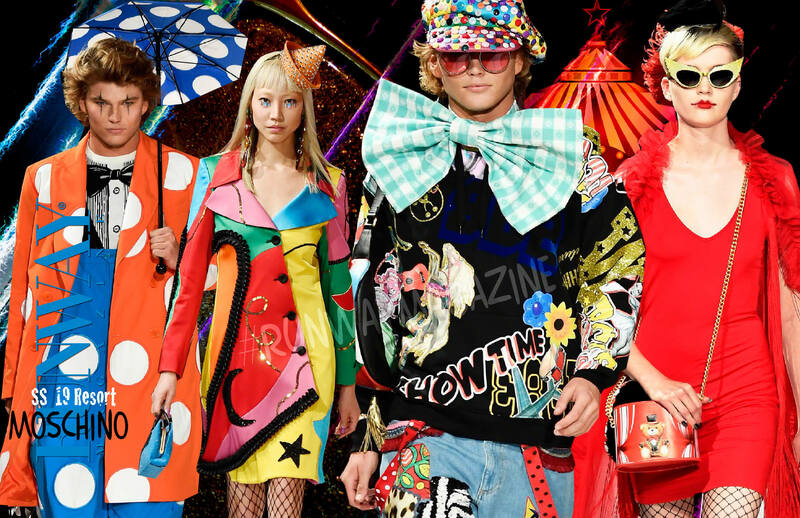 For the third show in Los Angeles during Men Fashion Week Jeremy Scott took the audience to circus, creating a tent of thrills and frills. Moschino is one of the most anticipated shows on the fashion week calendar and creative director Jeremy Scott creates headlines with every collection. 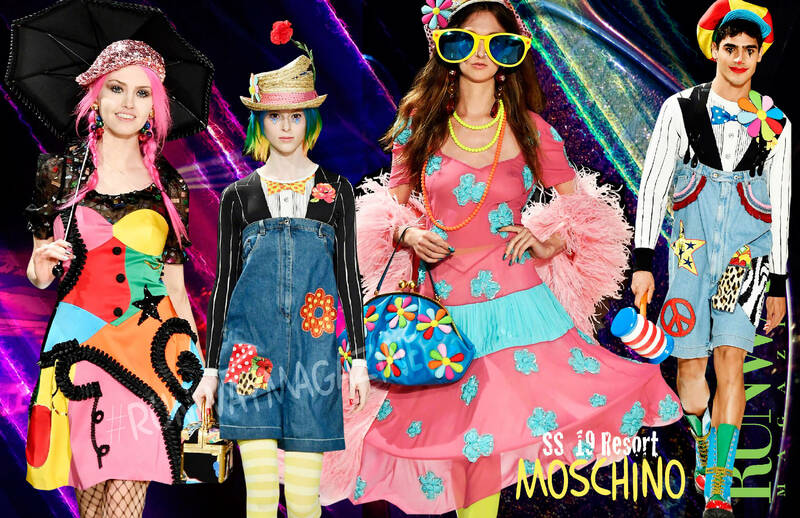 With previous collections inspired by everything from food to cartoons, toys and flight attendants, all eyes were on the Moschino resort 2019 to see what he would bring to the catwalk. 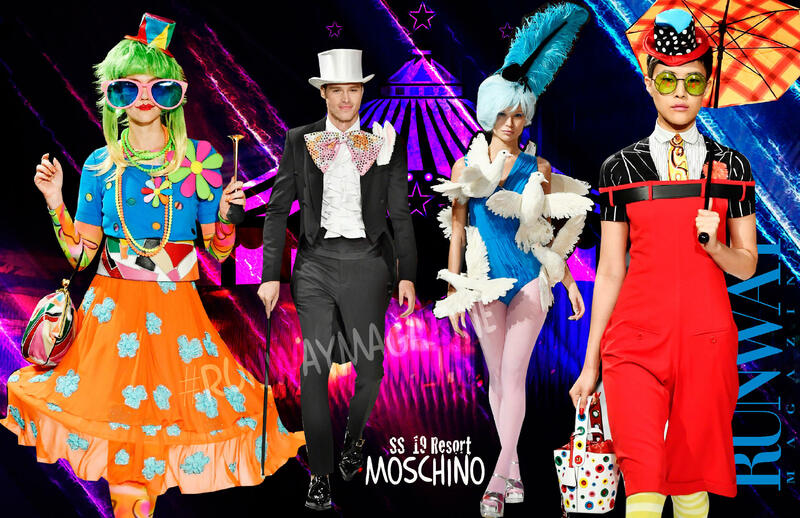 The Moschino resort 2019 and men’s spring/summer 2019 collections were shown at the Los Angeles Equestrian Center. 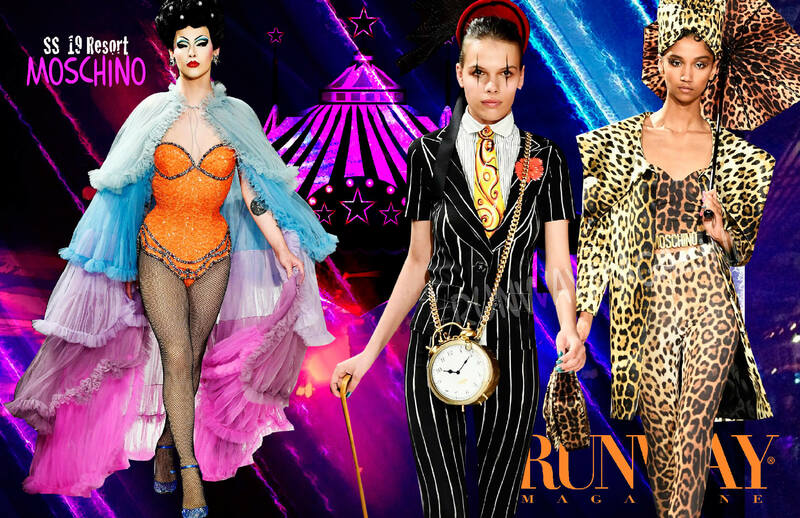 Guests were seated in a giant circus tent while models stormed the catwalk in a mix of clothes inspired by sparkly circus and stage costumes and party dresses. 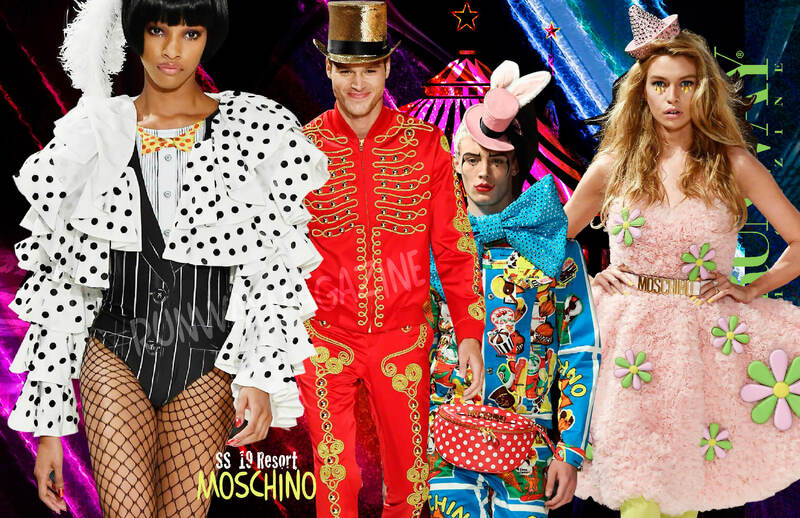 “Ladies and gentlemen of all ages, welcome to the Moschino circus!” boomed Jeremy Scott, who did his best P.T. Barnum as he strode into the ring of a giant blue-and-red-striped circus tent on Friday night. Decked out in a black and gold skeleton suit and top hat, the designer literally took center stage before his combined resort 2019 and spring 2019 men’s runway show at the Los Angeles Equestrian Center, and he relished every moment of it. “We have thrills and chills and plenty of frills tonight! You will witness death-defying acts of glamour! You will see beading and embroidery never before attempted in a setting like this! A kaleidoscope of colors will tantalize your eyes….So, without any further ado, let the show begin,” and with that, the crowd went wild before the first look had even hit the circular runway.